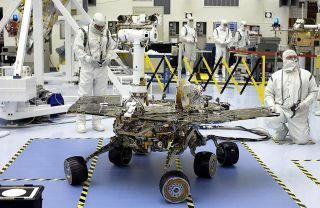 Pre-launch photo of NASA's Opportunity Mars rover at Kennedy Space Center in Florida. NASA's Opportunity Mars rover remains silent as a giant dust storm continues to swirl on the Red Planet. The storm began on May 30 and grew to encircle the entire planet a few weeks later. With so much dust in the air, the solar-powered Opportunity hasn't been able to recharge its batteries and has entered a sort of hibernation. "We have not heard from the rover for a couple of weeks," said Ray Arvidson of Washington University in Saint Louis. Arvidson is deputy principal investigator for the Mars Exploration Rover mission, which originally consisted of Opportunity and its twin, Spirit. The duo touched down in different locations on Mars a few weeks apart in January 2004. Opportunity kept right on rolling, long after Spirit's death. But the dust storm has sidelined the golf-cart-size rover: Opportunity hasn't sent a photo back to Earth since June 10, NASA officials have said. Spirit has long been silent, becoming bogged down in sand in late 2009. Its last communication with Earth was sent on March 22, 2010. Opportunity is now likely in a low-power mode, "in which the rover wakes up, checks its power and, if too low, just goes back to sleep again," Arvidson told Inside Outer Space. This graphic shows how the energy available to NASA’s Opportunity rover on Mars (in watt-hours) depends on how clear or opaque the atmosphere is (measured in a value called tau). "We have been listening, but no low-gain antenna communications yet. And the storm continues in full force," Arvidson said. "The storm has gone global and is still raging," said Jim Rice, geology team leader for the Mars Exploration Rover Project at Arizona State University's Mars Space Flight Facility. But, he added, "I'm still confident we make it through this."